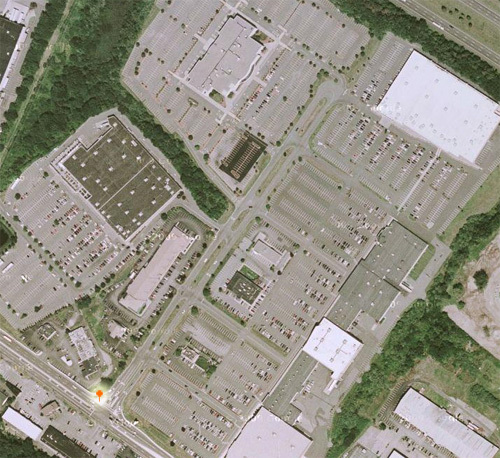 Maybe no landscape is more common or more recognizable in America than the big box retail highway. It’s everywhere and everywhere it’s the same: four lanes of traffic, lights at the major street intersections and mall entrances, miles and miles of empty sidewalks. What zoning relic mandates those interminable sidewalks? If you want to visit the next shopping complex over, you have to get in your car and drive to it, a la LA Story. Walking is less an option than a death wish. 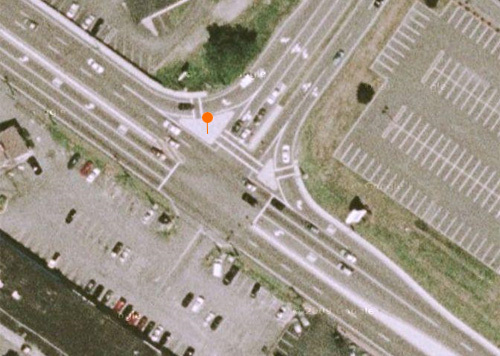 Satellite photos have a tendency to make everything appear simpler, like a picture of a diagram, but when you’re on the ground this is a very unpleasant junction, even in a car. In the lower right corner on the pavement in the far lane, the DOT has painted bike icons. This road has no shoulder and no dedicated bicycle lane; those icons are essentially sharrows. You’ve waited to turn left into a mall before, so you know just how heavy the traffic density is here. Factor in the impatience multiplier that comes from a day of shopping and you have a lot of unhappy drivers jammed into a road with zero space for bicycles. Do you think the drivers will share? You would be mad to find that answer. What I can’t understand is how an idea so poorly executed ever made the leap from planning to practice. I’m reminded of the New York City zoning regulations of the 1960s which allowed developers to build taller in exchange for public spaces at the street level. What seemed like a good deal instead became a gift to the developers as they quickly learned to build these spaces as inhospitable and inaccessible as possible, so as not to have to spend to maintain them or actually welcome in anyone from the public. Is something similar happening here? Did somebody get a grant for cycling infrastructure only to use a fraction of the money for the signs and paint? Skimming off cycling grant money, ha! What would they have made, $500? Occam’s razor says this is more likely good old fashioned incompetence. It’s still a stunner to see it in person. Had anybody involved ever ridden a bike in their life? It’s really that bad. At least you have sidewalks around your malls…ours is blocked in by limited access mulitlane highways, complete with rolling ramps and turns to get traffic in as quickly as possible with no thought to any pedestrian or bicycle traffic. To add insult to injury it is only marginally served by mass transit. I haven’t been to that area since I got rid of my car, but I seem to remember seeing little bike symbols painted on the streets in a few places. One was on the bridge going towards the highway on-ramp. 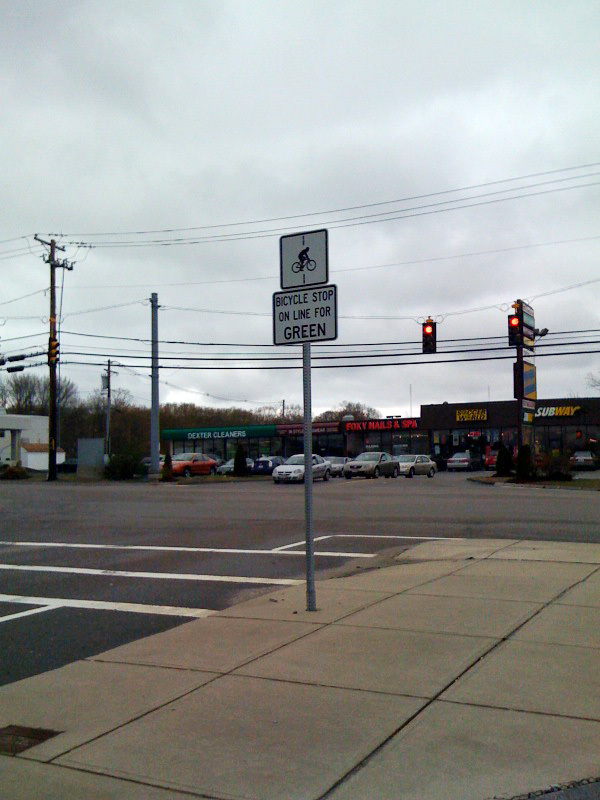 It seemed more like a warning to cyclists: “If you bike here, you will be squished flat like this guy right here.” If I need to go to Target, I prefer to go to the one in Warwick. It’s close to the Washington Secondary Bike Path and has ample bike parking! Of course, I have to bike across downtown and the West Side in order to get to the bike path, but I like biking in the city like that.